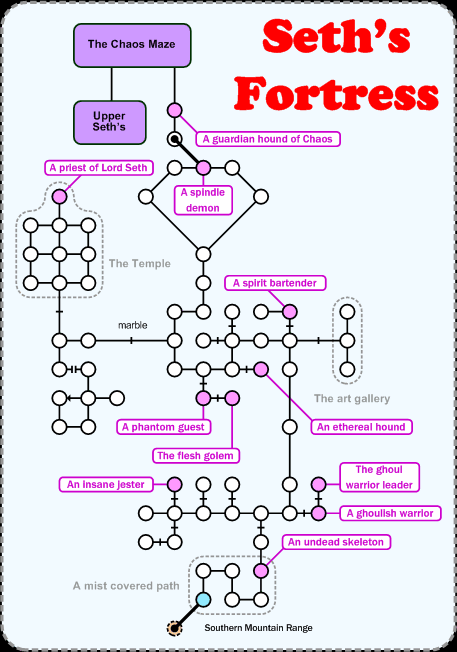 Seth's Fortress is split down the middle by the infamous Chaos Maze. While the lower half is great for levelling, upper seth's has many good run mobs, which put out a disproportionate amount of great equipment for evils. Mobs of note are Jade, Magus of Evil, Darkness, Onyx and of course Lord Seth. As if the Chaos Maze wasn't enough of a deterrant, you shouldn't be trying to get to upper seth's unless you've got a decent idea of what you're doing. Walk ( 6s, ne, 2s, se, 2e, s, 2sw, u, nw, ne, 2w, sw, 3s, 2se, ne, e, sw, s, 3e, 2u ) to get from DH to the room marked in blue.